Health begins where we live, learn, work, and age. Many factors in our environments impact our health and well-being (see figure). Medical care has been shown to account for only 20% of the variation of health outcomes. 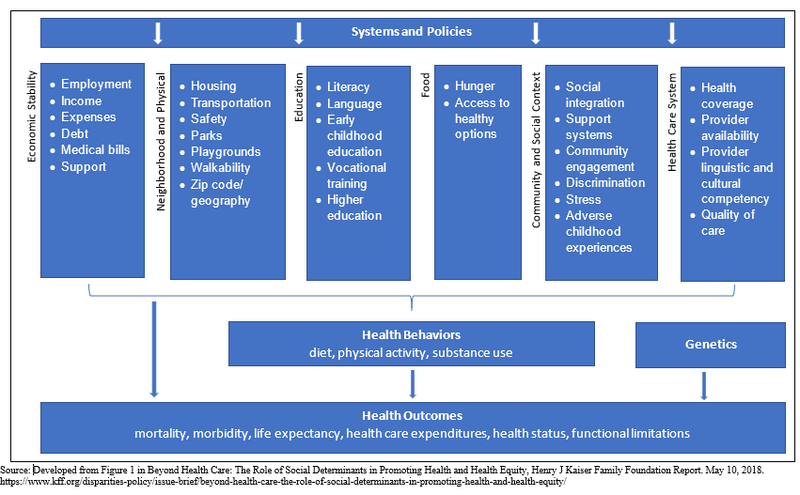 To improve health and well-being, these other drivers of health outcomes must be addressed. The first step to addressing patients’ unmet social needs (i.e. housing, food, employment) is to develop screening questions to assist in identifying patient needs. Many health systems have developed screening tools, however North Carolina is the first state to try and implement common screening questions across all health payers and providers. 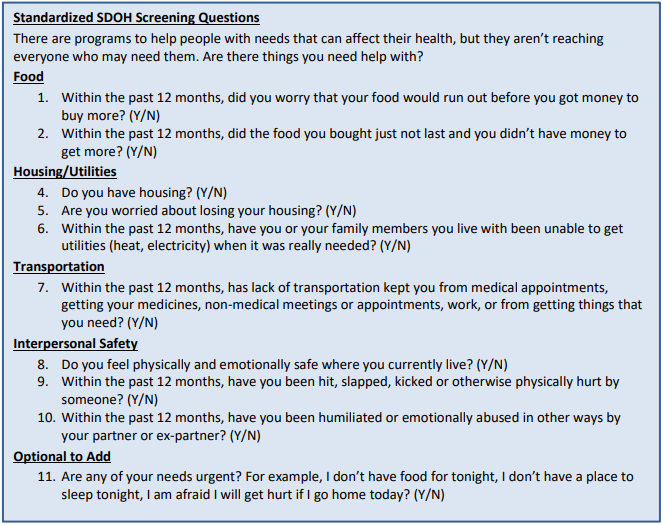 North Carolina’s Department of Health and Human Services’s (NC DHHS) Healthy Opportunities Initiative, which aims to ensure all North Carolinians have the opportunity for health, has developed a standard set of screening questions that can be used to screen patients for food, housing/utilities, transportation, and interpersonal safety needs (see below). As part of North Carolina’s Medicaid transformation plan, Medicaid beneficiaries enrolled in Prepaid Health Plans (PHP) will be screened by their PHP using the standardized screening questions. Other insurers and providers will not be required to use the screening questions, however NC DHHS’s goal is to have widespread adoption of the screening questions. If an unmet need is identified, the payer/provider screening the individual can use NCCARE360 to connect the individual to community resources. NCCARE360 is a new statewide tool that will provide a platform to refer and connect individuals with unmet resources needs with human service organizations in their community that can address those needs. While PHPs will be required to use NCCARE360 to connect their enrollees with community resources when unmet needs are identified, NCCARE360 will be accessible online and through a call center and can be used by anyone. NCCARE360 can facilitate referrals and allow the referring organization to track whether the individual accessed the services to which they were referred. In North Carolina, Medicaid transformation is the engine driving the development of a statewide, common infrastructure to address patients’ unmet social needs. The common screening questions provide a starting point for payers, providers, and communities to focus on how to work together to begin to address health-related social needs that are critical to improving community health and well-being. NCCARE360 will provide the infrastructure that is critical to connecting patients with unmet resource needs with local human service organizations that can address those needs.